Cologne/NRW/Germany: On Saturday, 2 May, 2015 up from 18h, we will have the pleasure to hear Hans Breuer, Mark Kovnatskiy , Michael Hübner and Anouk Chiche for a small concert in a very sympathic cultural café https://www.facebook.com/GarnichARTig.de, 10mn away from the main train station of Cologne. 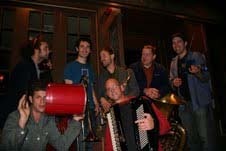 Are there any klezmer musicians that would like to play as well? If yes, please message me! Thanks... Please tell your friends living in the region about this! Linda Hirschhorn, Gary Lapow and Betsy Rose have been contributing great music to the Bay Area’s folk and progressive scene for decades. As part of the “boomer” generation, their songwriting has turned to such topic s as lasting love (or not!) and the changes that the decades have brought. Together they bring a wealth of musical and personal experience, from singing with children, to leading a successful women’s a cappella group, to musical activism for peace, justice and the 99%, to explorations of spirituality. These three friends offer timeless music for the seasons of our lives. Based on the memoirs of Isaac Bashevis Singer and adapted by David Licht for The Folksbiene in 1972 as a dramatization of the short stories serialized in the Yiddish Daily Forverts set in the Warsaw of Singer’s childhood years which pit modernism against tradition as Europe marched towards the first World War. With: Jeremiah Burch, Alec Burko, Matthew 'Motl' Didner, Itzy Firestone, Mo Hanan, Richard Kass , Stuart Marshall Hershkowitzl, Adam B. Shapiro, Carolyn Seiff, Amanda Miryem-Khaye Seigel, Lane Silberstein and Suzanne Toren. Lower level of 65 5th Ave. at 13th St. The concert will feature repertoire from the classical Central Asian repertoire, known as "Maqom", as well as other selections. The ensemble features Roshel Rubinov (voice and tanbur - long-necked lute), Yakov Rubinov (doira - frame drum) and Ilya Khavasov, voice. Roshel Rubinov is a master singer, poet, composer, and instrumental virtuoso. He was born in 1966 in Shahrisabz, Uzbekistan, and from 1983 to 1987 he attended the Mirzo Tursunzoda Art Insitute in Tajikistan, where he studied music and poetry with such luminaries as Neryo Aminov, Barno Ishoqova, and Abubakr Zuhuriddinov. Rubinov immigrated to Queens in 1995, where he quickly became one of the most active musicians in the Bukharian scene. He has performed at Carnegie Hall and on many other high profile stages in New York and around the world. Yakov Rubinov, Roshel's brother, was born in 1961 in Shahrisabz. An expert drummer, Yakov taught himself to play doira from a young age. Ilya Khavasov was born in Samarkand in 1961. Today, he is one of the leading singers in New York. Together, the Rubinovs and Khavasov perform classical music and popular music for weddings and other celebrations, bringing Bukharian traditions to a new generation. The May 6 concert is the culminating event for New School Professor Evan Rapport's Global Voices: Central Asia course, a joint effort between Eugene Lang College, the Center for Traditional Music and Dance and Center for Art, Tradition and Cultural Heritage as part of Lang College's "Civic Arts and Humanities" initiative, generously supported by a grant from the Andrew W. Mellon Foundation. The May 11th concert is a "Bukharian Choikhona" (tea house) programmed in partnership with Queens College Hillel and the college's Bukharian Cultural Club. Join us for an evening of beautiful violin music by two of klezmer's most talented practicioners: Deborah Strauss and Jake Shulman-Ment. 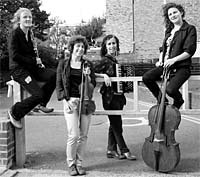 They present traditional melodies by recently rediscovered Eastern European composers as well as their own original compositions. Inspiration for the duo is far-ranging, and includes klezmer, cantorial, and Hasidic nigunim, as well as Romanian, Roma, Ukrainian, Polish, Russian, and Hungarian folk music. Purchase tickets online or call (202) 467-4600. Tickets are $44 each. Your purchased ticket(s) will be available at the Kennedy Center Box Office Will Call. The Nazi rise to power in 1933 cut short the careers of a generation of Jewish composers just entering their prime. Those who survived found their music branded as racially impure and banned from the concert hall. Even after the war, the shadows of Nazism continued to engulf these composers, obscuring some of their greatest masterpieces. In this concert, Pro Musica Hebraica presents a listening tour of the moment just before 1933 through three unique works all composed between 1928 and 1931. Perennial favorites The ARC Ensemble (Artists of the Royal Conservatory of Canada) return with stunning pieces by three titans of the post-World War I generation of European Jewish composers–Viennese romantic Erich Wolfgang Korngold, Polish modernist Jerzy Fitelberg, and Italian neoclassicist Mario Castelnuovo Tedesco. New Yiddish Rep’s “Seltzer Nights” will shake things up this spring! Tickets are $35. Call Ovation Tix at 866/811-4111, www.newyiddishrep.org or visit the Castillo Theatre box office, 543 West 42nd Street. An audacious new show headlined by the preeminent Yiddish vaudevillian Shane Baker and starring a cast of tens will shake things up at New York this winter. “Seltzer Nights” recreates the bawdy, boisterous and often back-biting atmosphere of a Yiddish music hall on the Lower East Side of a century ago, but with much better acoustics. Staged as an immersive theatrical cabaret, this star-infested variety show features a who’s who of the booming downtown Yiddish theater and music scene. “Seltzer Nights” dusts off some of the more risqué songs and comedy routines of the time as well as some of the more blatantly theatrical moments of popular melodrama that were all the rage on the Yiddish rialto. Summoning up the spirits of legends like Molly Picon, Jenny Goldstein, Jacob Adler, Boris Thomashefsky, Dzigan and Schumackher, and Fanny Brice, “Seltzer Nights” will keep you up at night. Just like a good pastrami sandwich! Tickets: $10 from the JCC's Émigré Department. More info: 415.292.1298. 415.292.1239. 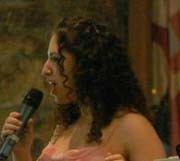 Heather Klein sings in Yiddish, numerous other singers in Russian, part of a gala concert observing the 70th anniversary of the victory over Germany in the Great Patriotic War, 1941-1945. Refreshments after the concert. Dmitri Shostakovich (1906-1975), a famous Soviet composer and Mieczyslav Weinberg (1919-1996), a Jewish composer who was persecuted by the Soviet State, had an unusual and long-term personal and professional relationship. While Weinberg was almost entirely ignored by the Soviet musical establishment, Shostakovich considered Weinberg to be one of the foremost Soviet composers and helped him in numerous ways including, protecting his family after Weinberg was arrested in 1953 on charges of "Jewish bourgeois nationalism." The two composers shared new compositions, and Shostakovich was influenced by the Jewish elements in Weinberg's music. Join us as we explore the history, relationship and music of these two extraordinary composers. The program will begin with a short talk by the Sidney Krum Series Artistic Director, Yuval Waldman, on the lives and musical contributions of Weinberg and Shostakovich. This presentation will be followed by the concert program, which will include selections from the film Winnie the Pooh (composed by Weinberg), as well as performances by the brilliant young artists of the Krum Concert Series of excerpts from Shostakovich's "From Yiddish Folk Poetry," piano trios by Weinberg and Shotakovich, and solo sonatas for violin and cello by Weinberg. Marmer's and Resnikoff's poetry reflects Yiddish/klezmer inspiration. Special Launch Event for the Stonehill Jewish Music Collection. Mark your calendar for an event celebrating the launch of a new website http://www.ctmd.org/stonehill.htm) for the Ben Stonehill Jewish Song Collection! 230 West 103 Street (SW corner of West 103rd Street and Broadway). Sunday, May 17th, 2015, 3 pm. 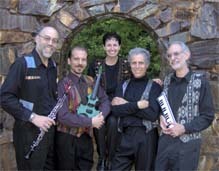 Tix: $25, visit www.newyiddishrep.org or call 888-596-1027. The production’s multi-lingual cast includes Israeli television star Gera Sandler (as Mikhoels), and Yelena Shmulenson (“A Serious Man”). “Making Stalin Laugh” world premiered in London last summer in an English-language production that The Independent called “a fascinating story.” New Yiddish Rep’s revised version will be performed in three languages -- Yiddish and Russian mostly and some English -- in a production that aims for language authenticity in its portrayal of the remarkable theatrical community that thrived (under dubious circumstances of course) as Stalin’s early support of the celebrated Moscow State Yiddish Theatre (GOSET) for propaganda purposes suddenly gave way to something far darker after the defeat of the Nazis and end of World War II. Dating back to 1921, when the GOSET troupe moved into a theatre a short distance from the Kremlin, Mikhoels and his colorful compatriots shrewdly managed to build a Yiddish theatre that was seen as a jewel of Jewish culture in the Soviet Union. Even though its audiences were mostly gentile, Jews in Russia followed with pride the rising fortunes of GOSET and the growing stature of the internationally acclaimed Mikhoels. Music led by Jeff Warschauer & Sarah Myerson, Cantorial Graduation Party! Every Sunday Morning, combining live music and food in a fresh, cultural environment, City Winery’s Klezmer brunch series pairs some of the greatest musicians in the world with delicious lox, bagels and other tasty fare on Sunday mornings from 11am to 2pm. City Winery's brunch on May 24, 2015 features Tavche Gravche. In temperamentvollen Frejlachs und schnellen Bulgar-Tänzen aus der traditionellen Hochzeits- und Tanzmusik der osteuropäischen Juden, in sephardischen Klängen aus dem Mittelmeerraum und Eigenkompositionen verbindet das Duo Doyna musikalische Welten: Die berührenden und mitreißenden Klezmer-Melodien, welche über Jahrhunderte hinweg verschmolzen sind mit den Bauerntänzen der ost- und südosteuropäischen Länder, wachsen in den virtuosen Improvisationen des Duos über sich selbst hinaus und verbinden sich mit Anklängen aus dem Jazz, Rock und Funk. Nun präsentiert das Duo Doyna seine Debüt- Live CD "Sammy´s Frejlach" (Konnex Records). Program also includes Brahms and Faure. 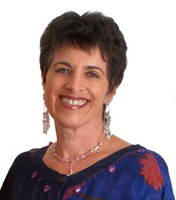 Music in the Mishkan series. Tickets: $20 general / $15 Shaar Zahav members.